"DataMaster has tested the new Xerox ColorQube and I must say that we were truly amazed by some points. If the solid ink technology is known on the market for small A4 machines, this is a première on the A3 MFP market. Firstly, we really appreciated the ease of use of this machine for a normal user. In our opinion, there is no machine easier to use on the Office market. The supply of ink is downright awesome ! The printing system is amazingly simple and requires no consumables : photoreceptors, toner cartridges or fuser. The absence of all these supplies advantageously campaign for environmental protection and tranquillity of those who manage the equipment in companies. This system calculates the number of pixels used for each color page printed. Note that Level 2 would cost only half of Level 3, which should be comparable to the color cost per page of current systems. Xerox is betting on the fact that the majority of color volumes produced in business today are on Level 2. In this situation, the proposed new tariff would provide significant savings to businesses and promote the use of color at a lower cost. In terms of ecology, Xerox ensures that a solid ink machine generates 90% less waste compared to a machine that uses toner. And to counter the power consumption in standby mode, higher than on conventional systems, the ColorQube has a program that adjusts consumption to human use. This program also provides a consumer operating lower than its competitors. Besides all this, the XeroxColorQube is a "traditional" MFP. With a range consisting of 3 engines (different speeds), the ColorQube uses many modules currently known on the B & W WorkCentre 5600 range : ADF, finishers or large capacity side tray. There is also a nice color touch screen already used by other machines Xerox : WorkCentre 6400 or Phaser 3635MFP. Regarding the general operation, its capabilities in document management (print, scan, fax, copy) are consistent with what already exists on the market. This new machine also remains comparable to its competitors that use toners, in terms of productivity and quality. Finally, the ColorQube is a big machine with the operating noise typical of this technology. It will be difficult to gain acceptance in the vicinity of a user. It is advised then to dedicate a room or an hallway to fully take advantage of this new office solution. 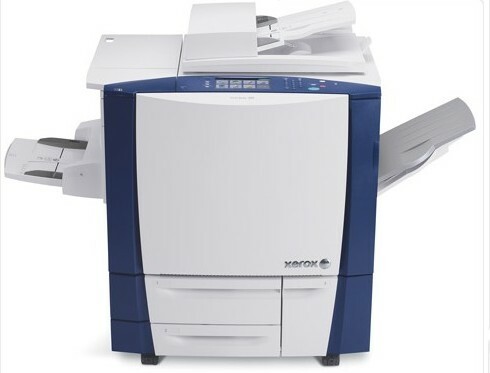 Will the Office Market succumb to the charms of the Xerox Green ColorQube and respond to the lure of this new billing method or reduce this new machine as "traditional copier" finally comparable to all others ?